Picture courtesy of Gary Walden (Bobby's brother) and Gary's daughter Ericha. 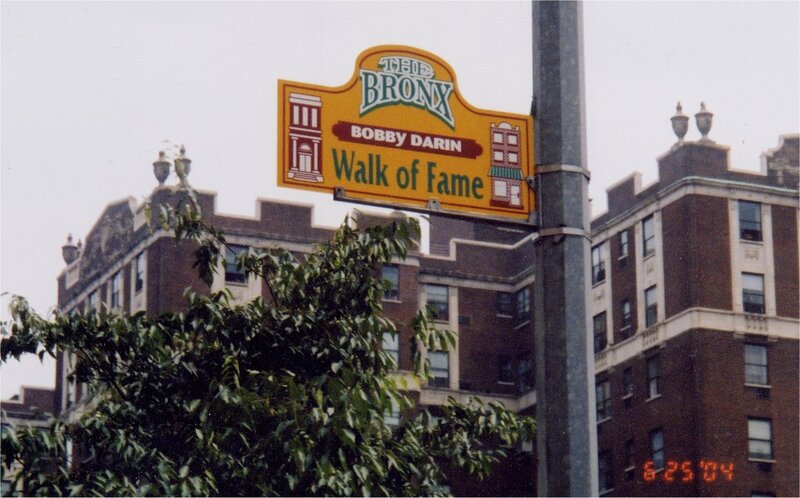 The Bronx Walk of Fame begins at 161st Street & Grand Concourse and runs south. Bobby Darin's sign is currently on 161st Street. On Saturday, June 26, 2004, Borough President Adolfo Carrion, Jr., Montefiore Hospital and Hip will present the Bronx Week Parade Food and Art Festival in the Bronx. The event is scheduled to begin at 10:00 a.m., 851 Grand Concourse, in the Rotunda two blocks from Yankee Stadium in the Bronx. Five well known Bronx personalities will be honored on Mosholu Parkway at 12 noon, one of whom will be Bobby. Everyone is invited. Bobby's street sign will be unveiled which is part of the Bronx Walk of Fame and he will join his place with other famous Bronxites, (i.e. Red Buttons, Garry Marshall, Regis Philbin, Rita Moreno, Diahann Carroll, Hal Linden and many others.) The festivities start Friday night at 6:30 PM. Since Dodd will be unable to attend on short notice, Gary Walden will join in the celebration. Harriet has also been asked to attend the Saturday morning breakfast at 9:00 AM. Our deepest thanks to Harriet Wasser and also Tracy McDermott and Doris Quinones of the The Bronx Tourism Council.